I've often wondered why pohe was such an important part of that last ritual until it dawned on me that if a girl can make pohe, she has some of the basics in place and will be able to feed her family most of the time, even if they get bored with the same ol' same ol'. Off I went to my pantry in order to be a true welcoming Maharashtrian girl and finally understood why pohe was not on my menu as often as it should be. Three bags of thin pohe and not a single bag of thick pohe. 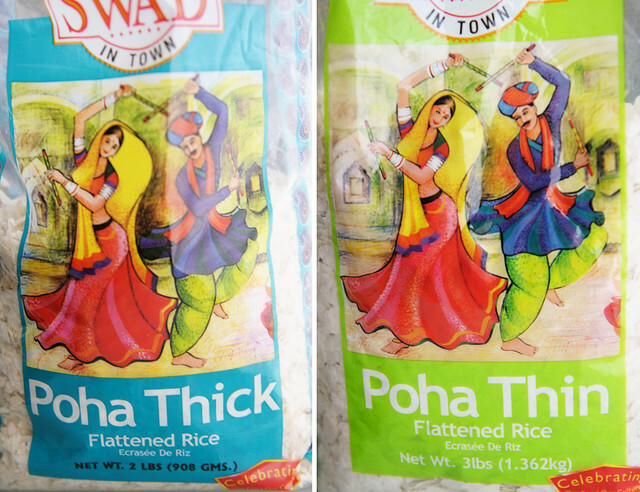 Those darned dancing people are the same and while the packet may be color-coded, I see Poha thi- and I grab it thinking I have bought the kind of pohe I need to make pohe. (That's another thing you have to bend your mind around if you're new to pohe: the uncooked flattened rice is called pohe and the cooked savory dish is also called pohe.) It's only when I get home that I realize that the thi- fooled me yet again and I add to my pile of thin pohe. So why do they write poha on the packages? Because in Hindi and in Gujarati, it is poha. Even powa and pauwa. In Marathi, it is pohe. I am biased but I think it sounds nicer. Thin pohe can be put to very good use: to make chivda, of course. It is now Kitt's job to show up for Diwali celebrations with a truckload of chivda. Yep, I'm looking at you, Kitt, for this year's party, too! Don't you have enough of those already? was thrown loosely in my direction when I finally bought the right kind of pohe. I was in a good mood else three of the older packets would have suddenly become air-borne with a trajectory aimed suspiciously towards the general area from whence that voice emanated. I've come across a few sites that have thin pohe in their ingredient list for pohe. Please. No. There are others that don't mention the kind of pohe you need. Thick. 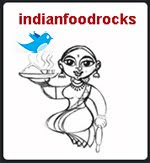 Most of the recipes are called kanda / kande pohe because they have onions. Only in dire circumstances do I ever make pohe without onions so I drop that qualifier. When I make pohe, I make a fairly large amount. It feeds us for at least two meals and a tea-time snack should anyone feel the need to dig in. Place the pohe in a colander and rinse in cool water. Drain well and set aside. Heat oil in a kadhai and when hot, add mustard seeds. When the mustard seeds do the dance of life, add asafetida followed by cumin seeds. 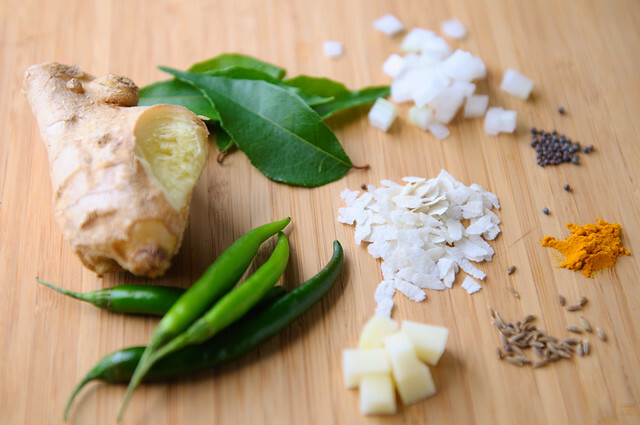 Add green chillies and curry leaves and cover the kadhai to avoid oil getting all over your stove. Turn the heat down. 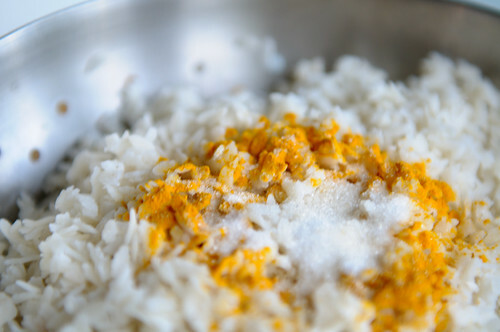 When things have calmed down some, uncover and add 1/4 tsp turmeric powder. Also add chopped onions and cook until they have softened. Next, add chopped potatoes, grated ginger, a dash of lime and salt to taste. What you have here is your main masala. This needs to be spicy enough to carry the flavors through the entire batch of pohe. It needs to be very spicy. Cover and cook on medium-low until the potatoes are cooked through. 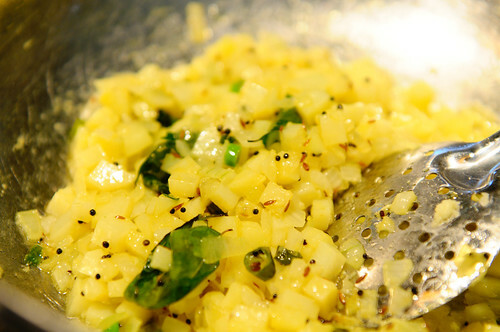 While the spicy mixture is cooking, break up any clumps that may have formed in the soaked pohe. To this, add 1/2 tsp turmeric powder, 1/2 tsp sugar, lime juice and salt to taste and toss to mix well. Add the pohe to the mixture in the kadhai in three parts, mixing well after adding each part. Taste and adjust the seasonings, if necessary. Cover and cook on medium-low heat for about 7-10 minutes, allowing the flavors to meld well. Either garnish with chopped cilantro or mix the cilantro into the pohe. Serve hot with tea. My mother used to say "one fistful of pohe for each person, if there are other dishes; two fistfuls if that's all you're eating." Her hands were teeny but that ratio still holds. Six cups are just right for us to eat over two meals and six cups was just right for our Diwali party last year. More oil always makes everything taste better and so in this case, too. I use as many tablespoons of oil as cups of pohe when I am cooking for a crowd. When I cook for us, I halve that number. I add about 1/4 cup of water to the potatoes to help them cook faster. When I do this, the pohe always taste better when they are just made than they do the next day. I sprinkle them with warm water before re-heating to moisten them up a bit. That helps some but not as much as using the additional oil would have. I used eight chillies in these pohe and they were still not spicy enough. I couldn't believe it either! Traditionally, pohe is served with a wedge of lime but I find it more convenient to add the lime to the soaked pohe and do away with flying wedges at the table and squirting lime juice in someone's eyes. I like to add spicy sev, especially bhujia sev, to my pohe for an extra zing and a crunch. 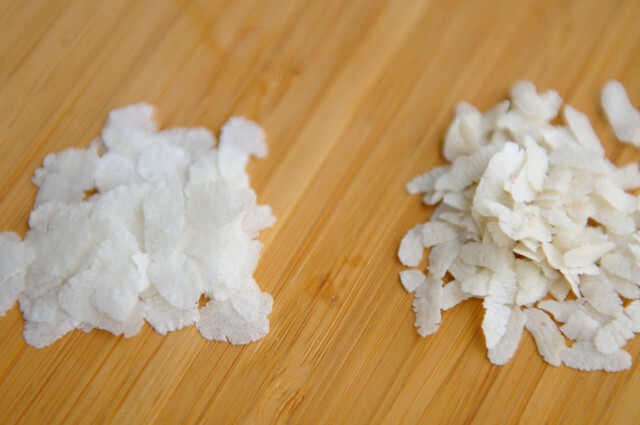 Fresh grated coconut is often used to garnish pohe. What's that you say? Speak up because I can't hear you? Tea party? I have no clue what you are on about. But I did put my brushes down for a bit, even if figuratively so; poured myself a freshly brewed cup of tea which I enjoyed with a bowl of pohe, dressed with bhujia sev. 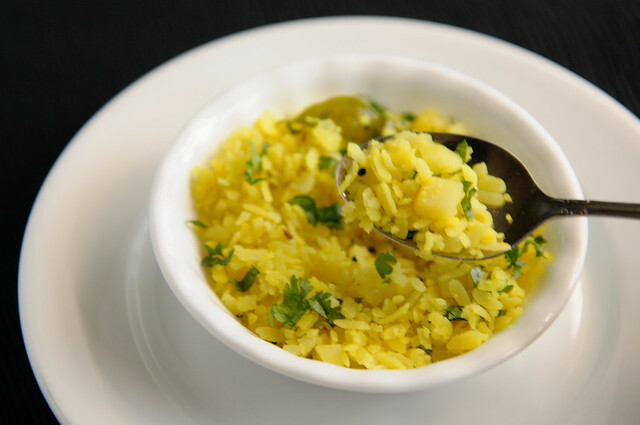 and your poha looks so tempting, I might need to make myself a bowl soon! reminds me of Charpoys being 'sunned' out in India! Don't know if you agree but, whats with the thick & thin poha in this country, there is hardly any difference.. I'm always worried if the poha is gonna disintegrate, if I soak it longer! In India thick Poha is THICK!! 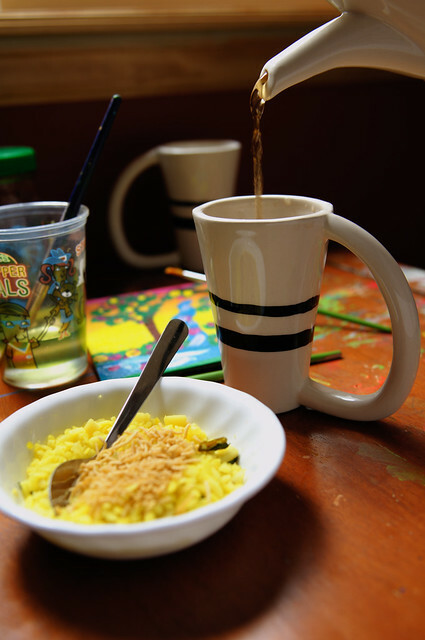 Love the quirky mug on your tea table - and the pohe looks exquisite. This is a simple dish, but not very easy to get right - which is why the "test" of cooking for the bride I think-time the grooms were asked to make this or rasam - if the lady falls ill, atleast she will get some succour! Of course there was a good reason behind parading the daughters...! I make my pohe same-to-same as yours including the but about adding lime to the entire quantity (though I add after they are done) - keeps it simpler. I don't use ginger though but will definitely try this the next time. Last time I cooked tooooooooo much (3/4 of the 500gm pack) so I think I will keep your measures in mind (I will double, of course!). Nice tea time...those cups! Perfect for the Madness...alas we have to wait still. That was delightful. The only thing this rookie is asking herself is why they even produce thin pohe if nobody likes it. Would love to learn about the difference. In my case, my mom and I were served poha at T's place when we went for the 'visit'. As to cybergabi's query about thin poha, besides chiwda, they are also used to make 'dadpe poha' which are no cook poha, with a phodni on top. As kids, we would eat the thin poha, soaked in milk and sugar. Pure bliss!. 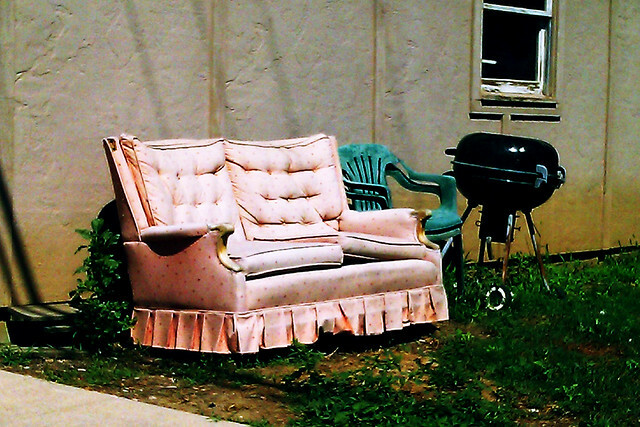 ramblin' rose, that couch was quite a find. We have lots more curious stuff like this in downtown Louisville! I wish I could say I remember what the poha in India was like but I don't. The two varieties we get here are also products of India so it may be a case of sourcing? I'm not sure. I don't leave the poha to soak in water and never have. I rinse it thoroughly under running water in a colander and drain. Maybe you could try that? I have brown poha which is very thick but haven't made anything with it as yet. I think purple potatoes would lend a gorgeous color to poha! Please take pictures! Anita, there was? What was the reason that grooms were never paraded? And, no, this is not for your tea party! Gabi, there are lots of uses for thin pohe. Chivda, as I mentioned, and a lot of other savory dishes where the pohe are either dry roasted or sprinkled with water before adding spices and aromatics. See Jaya's comment right below yours for some examples. Jaya, but did he make those pohe? In your case though, it matters not! T is a great cook! The next time I go to Guyana, I am definitely going to pick up a pack of this to try. The reason was to make sure they would be able to take care of everyone...We all want good looking partners because, science tells us, it reflects robust genes. Girls would also check out their prospective mates at the same time. Of course, the whole process of selection got twisted in favour of men once dowry became the ill it has. Since we are talking about the choices..and tea...whip up something impressive - everyone is watching! Uh uh! I've been buying and making (not that often) thin pohe all along! Next time, it's going to be the thick stuff. The last picture is lovely. I really enjoy reading your blog Manisha! U bet Manisha. I took quiet sometime to figure out why my pohe doesnt come out so well with thin poha. fInally one day I got thick one and then dhan ta dhan...it just worked so well.Ur Pohe looks yumm. Are you making Modaks ukadiche for this coming ganesh festive ?? OK, I got the hint! :-) When's Diwali? I love your thick pohe. Must make some of that, too. This was really good. I made it tonight, looking for something easy on my stomach and comforting, and it was just the thing. Thank you! So true - making poha....err...pohe is the test of basics for the Indian cook - like that business of French chefs and fried eggs. Neat idea - showing the size of the dice for the onion and potato for the perfect poha, err...pohe.